Asheville, NC—Momentum Gallery in downtown Asheville is pleased to participate in the Summer of Glass, a WNC celebration of glass art in conjunction with the Dale Chihuly exhibition at the Biltmore Estate, May-October 2018. The gallery exhibition, Reflections (July 1-August 25) nods to the Gilded Age, a period during the late 19th Century when the Biltmore Estate was conceived and constructed by railway tycoon George Vanderbilt. This curated exhibition features recent work by some of the country’s top contemporary glass artists with many of the works in the collection speaking to Vanderbilt’s aesthetic of opulence, grandeur, and beauty. Other conceptual pieces examine concepts of memory and history, referencing the “downstairs” or “behind the scenes” of the palatial mansion as well. 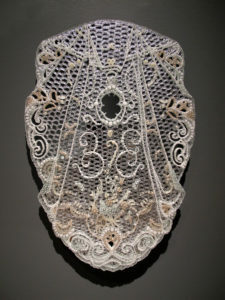 Sophisticated sculptures and stylish wall pieces incorporate a variety of glass techniques and explore the intricate detailing, ornamentation, and drama indicative of the Gilded Age. This Exhibit is free and open to the public. Reflections includes works by: Thor & Jennifer Bueno, Amber Cowan, Jennifer Halvorson, Alli Hoag, Joanna Manousis, Andy Paiko, Kit Paulson, Pablo Soto, and Tim Tate.